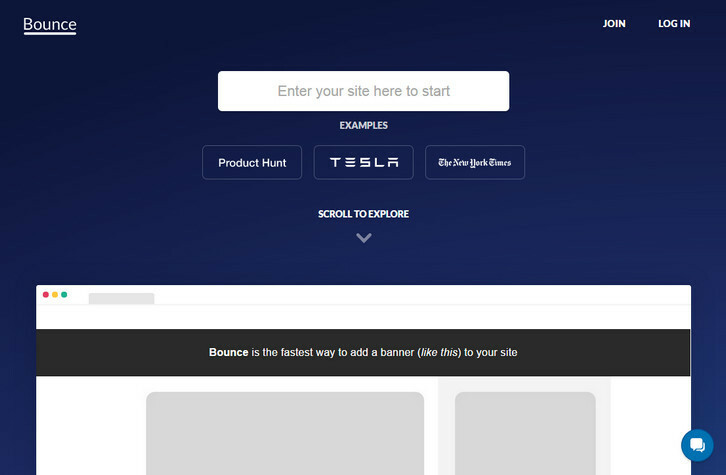 Bounce is a script that allows you to publish beautiful banner bars on your site with no coding required. Target bars to users based on where they came from, what page they’re on and whether they’re blocking your ads. You can show a bar to users who have an AdBlocker installed. Ask users to turn off AdBlock or promote alternative ways to support your site. These bars won’t be shown to users who don’t have an active AdBlocker. You can also display different bars based on which site a user was referred from. These bars display your custom message by checking the referrer that visitor came from to help convert users. It’s very neat. I just have a task to implement this functionality. The only reason I’m not going with this is because you can’t have dynamic text, and call it from JS. Developers are probably not their target group, but still, it could be useful in many situations. But you’re correct that at this point our main target group is not developers who can already add a bar to their site. We’re after those who either don’t know how to make a bar for their site or who don’t want to have to both with deployment every time they turn the bar on and off. Some developers have started using the bar to display messages only in the event of technical issues or maintenance though. It’s perfect for those sort of situations when you don’t want to deploy code.